The post type API lets you extend the types of content available in WordPress. Each type of content, or “post type”, should have a single responsibility. For example, “Post” and “Page” are post types built into WordPress and have separate responsibilities. “Post” is simply responsible for blog posts and “Page” for standard web pages. “Post” is responsible for only one thing; blog posts. 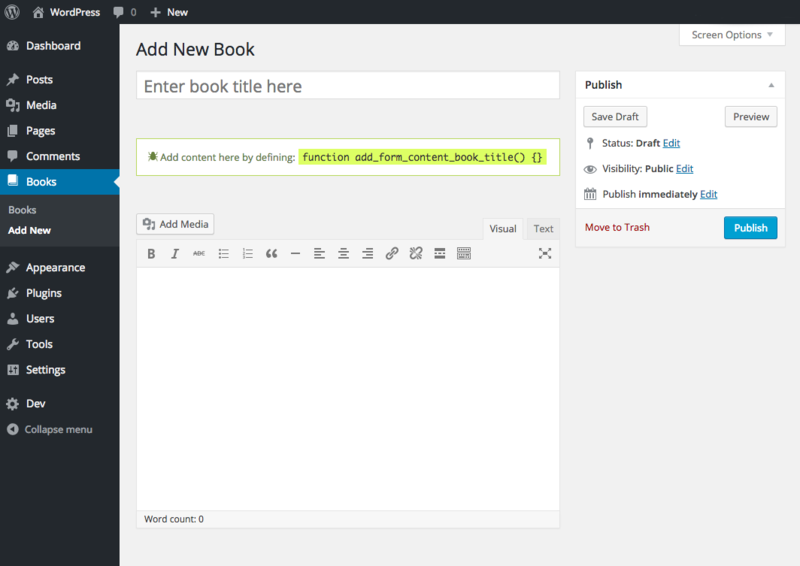 If you want to add a “Book”, type of content, to WordPress you don’t want to cheat and add a category of “Books” to a blog post. This will break single responsibility. Books are not blog posts. You want to create a post type called “Book” for your books. To get started with post types using TypeRocket read these docs. For terminologies sake, you “register” a “post type” when you want to add a new type of content. With TypeRocket 3.0 you add post types without having to understand the inner-workings of WordPress. To register a “Book” post type in WordPress you only need one line of code. This one line of code adds the post type to the admin, sets all the correct labels in the navigation and applicable places, and implements the required WordPress hooks. This would normally take many many lines of code. Note: you do not need to use any WordPress hook with TypeRocket here. TypeRocket takes Post Types to the next level. When you create a post type with TypeRocket you are instancing a special PHP object that can do much more. Let us assign the “Book” post type to a variable to see these features. In some cases, you will not want TypeRocket to manage the grammar for the post types plural form. You can set your own by supplying it as the second argument when creating the post type. For example when you have other ideas altogether. To modify an existing post type when using tr_post_type pass the post type ID/name as the only value. To set a custom menu icon use the setIcon() method. Note: Browse the “dev” TypeRocket plugin page in the admin under the "Icons" tab to see the list of options. By default "Enter title here" is the placeholder text of every post type. You can change this with TypeRocket, without hooks, by using the setTitlePlaceholder() method. There are 4 place to add custom content within the <form> element for each post type. You can open up these sections with 4 different methods: setTitleForm() for after the title, setTopForm() for before the title, setBottomForm() for the very bottom and setEditorForm() for after the editor. Take a look at opening up a content section after the title area. When TR_DEBUG is set to true, as it is by default, TypeRocket shows you where the section was opened and suggests a function to be used to add content. Note: this applies to all 4 methods. By creating the suggested function you are able to start printing content to the screen. Alternatively, when setting a form section you can supply an anonymous function as a callback to do the same. Take a look at adding content after the editor using a callback. Adding fields to a post type can be done with the form content methods. To set the slug for the custom post type and change the default use the method setSlug(). Any time you add a new post type or change the slug you need to flush the WordPress rewrite rules. Note: Flush rewrites by clicking "Settings > Permalinks > Save Changes". Sometimes you don't want post types to have an archive or single pages. You can use the setAdminOnly() method to keep a post type out of the front-end. Take a look at making a new post type that is admin only. You can set the number of posts that appear on the post types archive page using the setArchivePostsPerPage() method. limit - An integer -1 for all posts and any positive number for the specific limt. Adding Registrable (PostType, Taxonomy, MetaBox) object instances like a Taxonomy or MetaBox is extremely simple when using the TypeRocket post type object. To add a Taxonomy to a post type instance a Taxonomy and then use the apply() method. To add a MetaBox it is just as simple. To see what objects have been applied use the getApplied() method. You can also apply as many Registrable objects as you like using each as a new parameter. Also, an array. You can decide. The ID is used to specify the name that WordPress associates with your post types. It is also registered under the ID. When you register "Book" with TypeRocket the id is set to "book". There are 5 methods for dealing with arguments. Arguments are used when the post type is being registered. All arguments can be found in the WordPress codex. You can add and remove columns from the admin post type index page table using TypeRocket. Here we will use a post type of person for our examples. Also, we will have one custom field so we can add it in a custom table column. To add a column it needs to match the custom field's name. If the custom field is grouped then you need to use the base group name. The addColum() method takes up to 5 aurguments. field - The name of the field to add. You can use any string format but lowercase letters and _ (underscores) should be used for precision. sort - The column is sortable true or false. label - The tabled header column label. callback - The value to be displayed in the column. order_by - How the field should be ordered 'string' or 'number'. You can remove a column using the removeColumn() method. The removeColumn() method takes 1 string argument and it needs to match the field's name. In some cases, you will not have a title column and still want the "Edit | Quick Edit | Trash | View" controls to be used. To do this you will need to set a new primary column. You can also set the WordPress post types REST API resource location using the setRest() method. WordPress gives you a hook when a post type is registered. This makes registering post types developer friendly. This hook exists to let plugin developers limit post type conflicts. You can modify the registration if you need to from here.